Pet rabbits have bigger personalities than most people give them credit for. People who have never had a pet rabbit may not understand that each rabbit has their own unique personality. All rabbits do things to communicate that they are happy, sad, or scared and while every rabbit is different, certain behaviors mean the same thing for most rabbits. When I think of a rabbit doing a binky I often think of someone gleefully jumping into the air and clicking their heels together. While rabbits don't actually do that Fred Astaire heel click, they do leap into the air and twist their bodies to show that they are happy or excited. Someone who doesn't know what a binky looks like may think that their rabbit is scared and running away or that something else is wrong with them but a binky is a very normal, natural thing for a happy rabbit to do. All rabbit owners should have bunnies happy enough to binky. Rabbits are natural diggers. Their wild cousins dig burrows for nesting and to make their homes and our house rabbits dig for fun. This is an instinctual behavior but it can be bothersome and destructive for their humans that love them. Rabbits will also dig on your feet or hands to get your attention. Digging is normal! If your rabbit has ever run around the room as fast as they can as though something is chasing them then you've witnessed the bunny 500. This behavior is a happy one and your bunny is zooming around out of pure excitement. Perhaps they are playing with you or a furry friend or are expecting a favorite treat but regardless of the reason, the bunny 500 is not only entertaining to watch but you can rest assured knowing that this means your rabbit is one happy bunny. Some people get nervous when they see their rabbits flop over onto their sides but this flopping is a sign of a content rabbit. Usually your rabbit will be resting, sitting up, and then roll onto their side to lie down. This flopping motion is much different than a seizure because your rabbit will be very relaxed, their eyes will most likely be closed and their legs will not be moving. Flopping is a normal rabbit behavior and it means your rabbit is relaxed. Rabbits are social and while most people who have never owned a rabbit have never heard a rabbit make a noise you can rest assured that they have their own vocabulary to tell us and each other how they feel. Some noises are very obvious such as screaming. A rabbit will only scream if they are scared, stressed, or frightened. You will hopefully never hear a rabbit scream. Other less alarming noises include a buzz or honk noise, which can mean they are excited and is usually done while they are circling and sniffing another rabbit, and teeth grinding. Teeth grinding can mean your rabbit is uncomfortable or in pain but it can also mean they are content. If the teeth grinding (also referred to as purring) is heard while your rabbit is sitting up, hunched and not moving then it most likely signifies they are in pain. If it is heard very softly while your rabbit is relaxed, such as after flopping, then it means they are relaxed. Growling is another noise that you may hear if you have a territorial rabbit or if they are angry or stressed out. 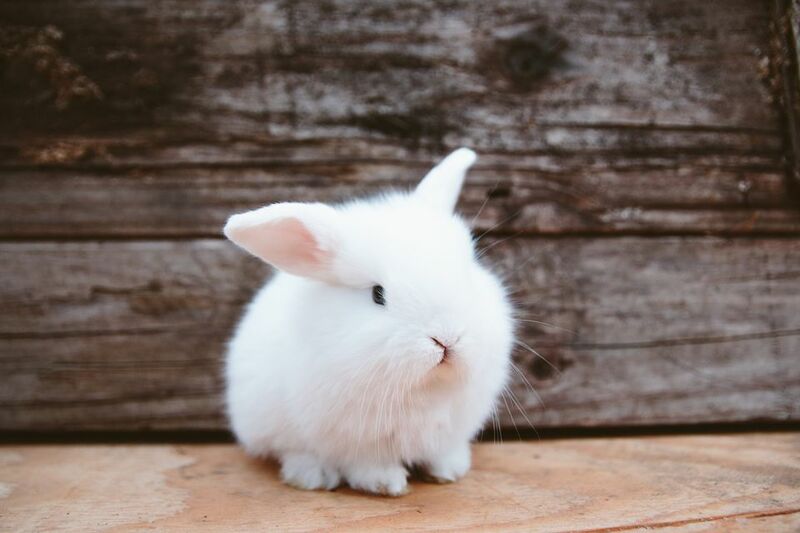 Neutering or spaying your rabbit will help to relieve any territorial tendencies but you may still hear growling if you are trying to introduce a new rabbit to your bunny. If you hear growling you should separate the rabbits because a growl is an indication that a fight or other type of aggressive behavior may occur. Rabbits can deliver a very strong kick if they want to. They have powerful hind legs and if they are displeased they may kick to try to get away or indicate they want to be put down if they are being held. If your rabbit appears to kick as they hop away from you they are trying to kick up dirt to show they are upset. If a rabbit is kicking while you are holding them then you should carefully set them down because they can hurt or paralyze their back if they kick hard enough while being held. If your bunny is nudging his nose on toys or you it is because this is their way of exploring and investigating things. Just like sharks bonk and nudge to get an idea of what it is they are looking at, rabbits have very sensitive little noses that help them discover what makes up their environments. Sometimes a bonk or nudge is followed by a nip to further test it out or to indicate that the rabbit wants you to move or pay attention to you. Rabbits may give you an innocent nip to get your attention but they can also bite to show dominance, out of fear, or to say they don't like something/someone. Rabbits may bite each other if they are fighting or if an established rabbit doesn't like a new rabbit, out of sexual frustration or to establish a hierarchy with the other rabbits they live with, or simply because they don't want to do something if you are trying to pick them up or put them in a cage. Rabbits aren't usually aggressive and neutering or spaying can help resolve any aggressive tendencies. A rabbit that thumps their hind leg is an upset rabbit. Thumping is a sign that is meant to warn other rabbits that there is something in the area to avoid. Thumping can mean danger is near or that they are mad or feel threatened. Rabbit tongues are just the cutest and the little licks that rabbits give are no different. They may not be kissers like dogs but they are often seen grooming themselves or their rabbit friends with their cute little pink tongues. This is very normal behavior but if a rabbit ingests too much hair it can cause a problem. Be sure to help your rabbit with their grooming regimen by regularly combing or brushing them. Rabbits have scent glands on their face like many other animals. Sometimes rabbits will rub their chin on something (which is referred to as chinning) to tell other rabbits that the object is theirs. This is a normal way of marking their territory. What Should You Feed Your Rabbit? What Wood Can My Rabbit Chew?